ABSTRACT. A recent taxonomic revision indicated that Macrobrachiumpotiuna, an endemic prawn in Brazilian freshwater drainages, exhibits wide morphological variability along its limited geographical distribution. However, in some cases, taxonomic doubts at the species level have no clear morphological resolution. Considering that no molecular data of M. potiuna along its distribution were available to provide a complete and integrated overview, we analyzed 21 partial sequences (531 bp) from the mitochondrial 16S rRNA gene of M. potiuna and 9 sequences from outgroup species, by maximum likelihood and parsimony, in order to investigate the possibility of the existence of cryptic species, within the morphologically based M. potiuna. The topologies obtained revealed that M. potiuna represents a monophyletic clade. Nevertheless, two clades supported by both analyses were formed within the M. potiuna taxon. The mean genetic divergence between these two groups was 0.044 ± 0.007, and within each group (i.e., M. potiuna "sensu stricto" andM. potiuna "Affinis-Clade") the divergences were 0.010 ± 0.003 and 0.028 ± 0.005, respectively. As far as we know, this is the first report to show a genetic separation between populations of prawns with abbreviated larval development in South American drainages. Pending additional analysis, to propose a conclusive inference, the existence of these distinct genetic groups must be considered in future studies with the morphologically based M. potiuna. In addition, we extended the known northern distribution with a record from the state of Bahia. Keywords: evolutionary ecology, freshwater crustaceans, genetic variability, phylogeny, sympatric speciation, Palaemonidae. RESUMEN. Una revisión taxonómica reciente reveló que el camarón endémico, Macrobrachium potiuna, distribuido en riachuelos brasileños, presenta una alta variabilidad morfológica a lo largo de su limitada distribución geográfica. Sin embargo, los problemas taxonómicos a nivel de especie no parecen tener clara resolución en algunos casos. Considerando que no hay datos moleculares disponibles de M. potiuna a lo largo de su distribución, que puedan proveer una visión general completa e integrada, se analizaron 21 secuencias parciales (531pb) del gen mitocondrial 16S, de M. potiuna y 9 secuencias del grupo externo, usando máxima verosimilitud y máxima parsimonia, para investigar la posibilidad de que exista una especie críptica dentro de M. potiuna. Las topologías obtenidas mostraron que M. potiuna es un grupo monofilético. Sin embargo, se formaron dos clados internos, bien soportados por ambos análisis. La divergencia genética promedio entre estos dos grupos fue de 0,044 ± 0,007; dentro de los clados (i.e., M. potiuna "sensu stricto" y M. potiuna "Affinis-Clade") las divergencias fueron de 0,010 ± 0,003 y 0,028 ± 0,005, respectivamente. Hasta donde se sabe, este es el primer estudio que muestra una separación entre las poblaciones de camarones de agua dulce de Sudamérica con desarrollo larval abreviado. En espera de un análisis más exhaustivo, que proponga una conclusión definitiva, la existencia de estos dos grupos genéticos distintos debe ser considerada en estudios futuros de M. potiuna, basados únicamente en morfología. De manera adicional, este trabajo incluye una extensión en la distribución norte de M. potiuna hasta el estado de Bahía. Palabras clave: ecología evolutiva, crustáceos dulceacuícolas, variabilidad genética, filogenia, especiación simpátrica, Palaemonidae. Morphological characters have been used as the main data to delimit and recognize species. Morphological data are usually easier to be access and make species determination practicable, without the use of expensive tools. However, the great variability of some diagnostic characters, due to phenotypic plasticity and other causes, complicates species delimitation in several groups of prawns (Pereira, 1997; Liu et al, 2007; Pileggi & Mantelatto, 2010; Vergamini et al., 2011). Moreover, genetically different biological entities, such as cryptic species, might be morphologically indistinguishable (Mayr, 1963, 1969; Knowlton, 1986). Therefore, molecular tools have been applied to assist in species delimitation and recognition in several cryptic decapod species (Keenan et al., 1998; Schubart et al., 2001a, 2001b; Kitaura et al., 2002; Lai et al., 2010; Pileggi & Mantelatto, 2010; Mantelatto et al., 2011). Molecular tools are extremely useful to solve many taxonomic problems and have been applied successfully to prawns of the genus Macrobrachium Spence Bate, 1868 (Liu et al., 2007; Pileggi & Mantelatto, 2010; Vergamini et al., 2011). The genus Macrobrachium is a worldwide group represented by 243 brackish and freshwater species (De Grave & Fransen, 2011). Some American species, such as Macrobrachium olfersii (Wiegmann, 1836), have wide distributional ranges (i.e., throughout the Atlantic coast), while species such as Macrobrachium potiuna (Müller, 1880) are endemic to smaller regions. Even with a restricted distribution, species might show wide morphological variation between populations due to their phenotypic plasticity, or as a response to different selective pressures, and adaptations to each kind of environment (Dimmock et al., 2004; Schluter, 2009). As typically observed in most other members of this genus, M. potiuna is a freshwater species characterized by a long incubation period (extends to about 50 days; Bueno, 1981; Bond & Buckup, 1982) and extremely abbreviated larval developmental period (approx. six days; Melo & Brossi-Garcia, 1999 as Macrobrachium petronioi Melo, Lobão & Fernandes, 1986). It is endemic to Brazilian drainages (Melo, 2003), distributed from the states of Bahia, northeastern Brazil (first record in this paper) to Rio Grande do Sul, southern Brazil. The latter region includes the type locality of the species, Rio Itajaí in Blumenau, Santa Catarina (Müller, 1880). The great morphological variation of this species is unquestionable and, in the past, has led some authors to propose new species (e.g., M. petronioi) based on a morphologically disparate form of M. potiuna. Recently, M. petronioi was suggested to be synonymous with M. potiuna (Pileggi & Mantelatto, 2010; Pillegi & Mantelatto, 2012), and from here on we used the name "M. petronioi" under quotes. Nevertheless, this known morphological variability along a limited range of distribution, in association with the differences in the environmental conditions, where this species occurs, raises doubts as to whether the morphologically based M. potiuna is actually comprised of several distinct cryptic species. Therefore, this study aimed to investigate the possibility of the existence of genetically different groups of M. potiuna throughout its entire distribution, and to test the hypothesis that cryptic species exist within this taxon. Specimens of Macrobrachium potiuna were obtained from field collections throughout its distributional range from the northern limit in Bahia (16°S) to Santa Catarina (26°S). Specimens were collected in two different types of environment: hills and slopes (SHSE), which usually have clear water, rocky bottoms, and rapids; and streams of coastal lowlands (SCLE), which usually have dark water, marginal vegetation, and slow currents. Newly collected specimens were deposited in the Crustacean Collection of the Department of Biology (CCDB), Faculty of Philosophy, Sciences and Letters of Ribeirão Preto (FFCLRP), University of São Paulo (USP), Brazil (Table 1). All molecular sequences used in this study were generated by the Laboratory of Bioecology and Crustacean Systematics (LBSC), Department of Biology (CCDB), Faculty of Philosophy, Sciences and Letters of Ribeirão Preto (FFCLRP), University of São Paulo (USP), as part of a long-term study on the molecular taxonomy of freshwater shrimp-like crustaceans. 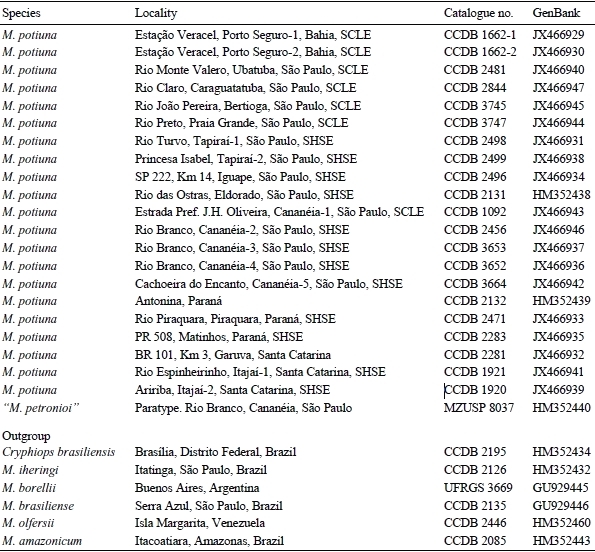 Genetic vouchers generated were deposited in the CCDB under the accession numbers listed in Table 1. Sequences of five American species of Macrobrachium and one of Cryphiops brasiliensis Corrêa, 1973, also generated by us previously, were retrieved from GenBank for use as outgroups (Table 1). Table 1. Species of Macrobrachium and outgroup used for the phylogenetic analyses, with their respective collection locality, habitat, catalogue number, and genetic database accession numbers at GenBank. Museum/collection abbreviations: UFRGS: Crustacean Collection of the Federal University of Rio Grande do Sul, CCDB: Crustacean Collection of the Department of Biology of the Faculty of Philosophy, Sciences and Letters of Ribeirão Preto, University of São Paulo. SHSE: streams of hills and slopes environment; SCLE: streams of coastal lowland environment. DNA extraction, amplification and sequencing protocols followed Schubart et al. (2000), with modifications as in Mantelatto et al. (2007, 2009) and Pileggi & Mantelatto (2010). Total genomic DNA was extracted from the muscle tissue of the abdomen. An approximate 550-bp region of the mitochondrial 16S rRNA gene was amplified from diluted DNA by means of a polymerase chain reaction (PCR) in an Applied Biosystems Veriti 96 Well Thermal Cycler® (thermal cycles: initial denaturing for 5 min at 95°C; annealing for 40 cycles: 45 s at 95°C, 45 s at 48°C, 1 min at 72°C; final extension 3 min at 72°C) with universal 16S mtDNA primers 16Sar (5'-CGCCTGTT TATCAAAAACAT-3') and 16Sbr (5'-CCGGTCTGAACTCAGATCACGT-3') (Palumbi & Benzie, 1991). PCR products were purified using Sure Clean (Bioline), and sequenced with the ABI Big Dye® Terminator Mix (Applied Biosystems, Carlsbad, CA) in an ABI Prism 3100 Genetic Analyzer® (Applied Biosystems automated sequencer) following Applied Biosystems protocols. All sequences were confirmed by sequencing both strands. A consensus sequence for the two strands was obtained using the computational program BIOEDIT 7.0.5 (Hall, 2005). Estimates of genetic divergence (p-distance) over sequence pairs between and within groups were conducted in MEGA 5, using pairwise deletion of gaps and missing data (Tamura et al., 2011). The maximum likelihood (ML) analysis was conducted in the RAxML program (7.2.7) (Stamatakis, 2006), implemented in CIPRES ("Cyberinfrastructure for Phylogenetic Research") (http://www.phylo.org), and the assumed evolutional model was GTR+r+I ("General Time Reversible" + Gama + invariable sites). The consistency of topologies was measured by the bootstrap method (1000 replicates), and only confidence values >50% were reported. In the parsimony analysis, we carried out a dynamic analysis in software POY version 4.0 (Varón et al., 2007), under direct optimization (Wheeler, 1996). The topology consistency was measured by Bremer support. All data sets were analyzed, under 10 parameter sets, for a range of indels, transition and transversion ratios, and only the tree with the best parameter sets is presented here. Nineteen new partial sequences (531 bp) of the mitochondrial 16S rRNA gene were obtained from specimens identified as Macrobrachium potiuna based on morphological characters. The topologies obtained by maximum likelihood and parsimony analyses revealed that M. potiuna represents a well-supported monophyletic clade (i.e., bootstrap and Bremer support), from now on referred to as M. potiuna "sensu lato" . Nevertheless, two clear clades supported by both analyses were formed within M. potiuna "sensu lato" . These clades are referred to here as M. potiuna "sensu stricto" and M. potiuna "Affinis-Clade" (Figs. 1-2). Figure 1. Phylogenetic tree for Macrobrachium potiuna and related species based on direct optimization analysis of 16S rRNA gene datasets, under the parameter set which produced the most parsimonious tree. 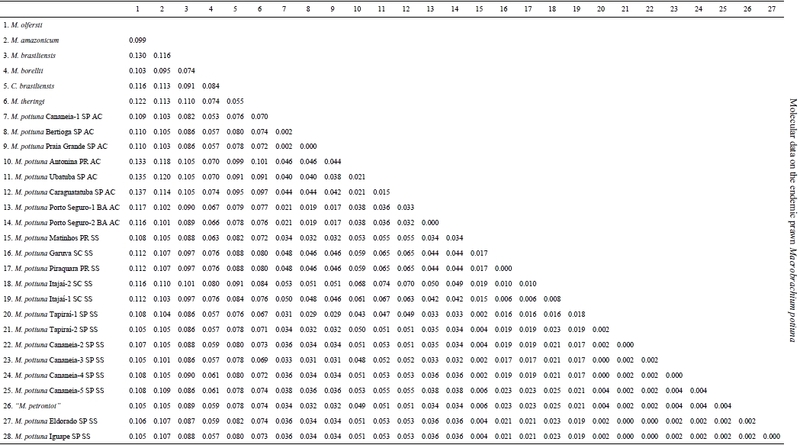 Numbers above are bremer support values. SHSE: streams of hills and slopes environment, SCLE: streams of coastal lowland environment. BA: Bahia, PR: Paraná, SP: São Paulo, SC: Santa Catarina. Figure 2. 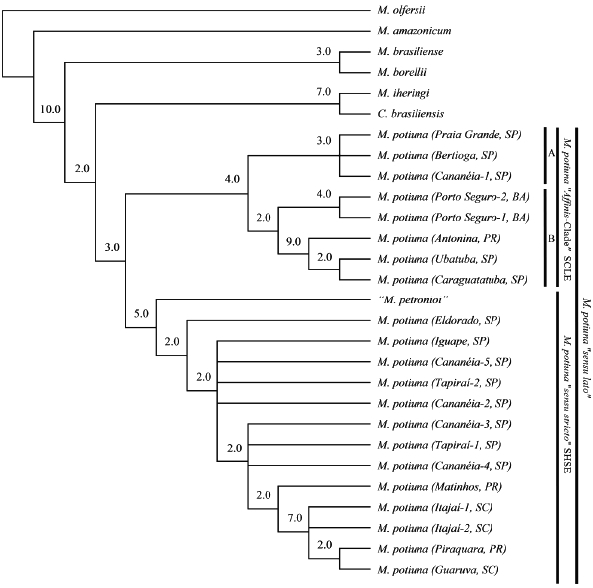 Phylogenetic tree for Macrobrachium potiuna and related species based on maximum likelihood analysis of 16S rRNA gene. 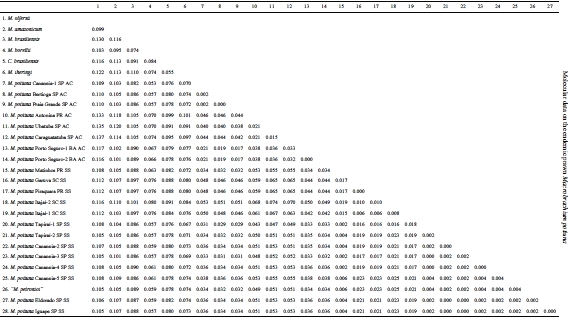 Numbers below are significance values for 1000 bootstraps; values <50% are not shown. SHSE: streams of hills and slopes environment, SCLE: streams of coastal lowland environment. BA: Bahia, PR: Paraná, SP: São Paulo, SC: Santa Catarina. Genetic variability ranged from 0 to 0.025 among the M. potiuna "sensu stricto" specimens (mean 0.010 ± 0.003) and from 0 to 0.046 among the M. potiuna "Affinis-Clade" specimens (mean 0.028 ± 0.005). The divergence between groups ranged from 0.029 to 0.074 (mean 0.044 ± 0.007) (Table 2). Table 2. Genetic divergence matrix of the 16S rRNA gene among species of Macrobrachium observed in the phylogenetic analyses. Locality abbreviations: BA: Bahia, PR: Paraná, SP: São Paulo, SC: Santa Catarina. AC: M. potiuna “Affinis-Clade, SS: M. potiuna “sensu stricto. The Macrobrachium potiuna "sensu stricto" clade includes specimens from areas near the type locality in the states of Santa Catarina and Paraná and specimens from southern São Paulo, mainly found in streams of hills and slopes (Fig. 3). Some specimens from southern Brazil (Paraná and Santa Catarina) formed a homogeneous and distinct group within the M. potiuna "sensu stricto" clade. 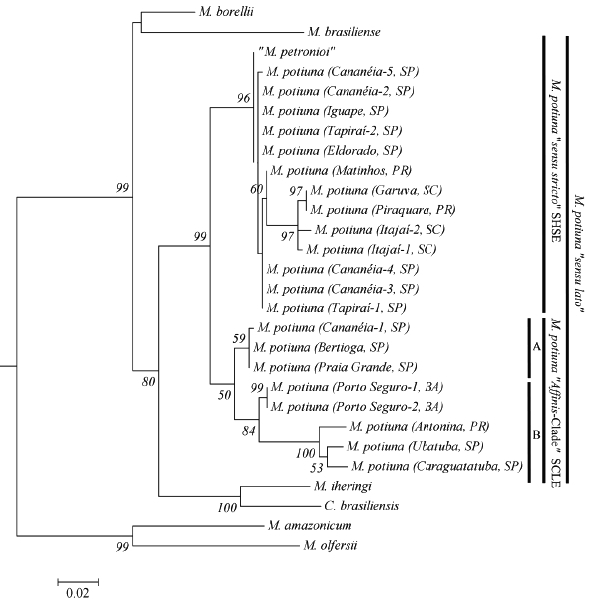 This clade also included the paratype of "M. petronioi" . Figure 3. Sampling sites of M. potiuna “sensu stricto” and “M. potiuna “Affinis-Clade”. BA: Bahia, ES: Espirito Santo, RJ: Rio de Janeiro, SP: São Paulo, PR: Paraná, SC: Santa Catarina, RS: Rio Grande do Sul. The M. potiuna "Affinis-Clade" includes specimens from São Paulo, Paraná and Bahia, mainly found in lowland streams. This clade was less well supported by bootstrap compared to the M. potiuna "sensu stricto" clade (Fig. 2); however it had the same Bremer support (Fig. 1). The M. potiuna "Affinis-Clade" also presented two subgroups that were well supported in both the maximum likelihood and parsimony analyses (Figs 1-2). A subgroup was formed by specimens from southern São Paulo (subgroup A), and another was composed by specimens from a wide geographical distribution, including Bahia, northern São Paulo and Paraná (subgroup B). The mitochondrial DNA (mtDNA) marker was able to show the existence of at least two different groups within the species, currently recognized as Macrobrachium potiuna, which may indicate the possible existence of cryptic species. To the best of our knowledge, this is the first report to show genetic separation among populations of a freshwater shrimplike form, with abbreviated larval development, inhabiting South American drainages. The collections of individuals from Bahia reported here, represent the first record of Macrobrachium potiuna "sensu lato" in this state. Additional specimens were collected in Una, Bahia (15°12'S, 39°3'W; Universidade Estadual de Santa Cruz collection - UESC 1348, 1357 and 1359), extending its northern distribution by about 450 km from past records. Previous studies in nearby areas failed to report this species (Barros & Braun, 1997; Almeida, 2008), which may indicate that the species is rare in this area compared with southeastern and southern Brazil, where it is easily found in coastal basins. The results confirm "Macrobrachium petronioi" as a junior synonymous of Macrobrachium potiuna, since the paratype of "M. petronioi" was allocated in the M. potiuna "sensu stricto" clade. The synonymy between these species was previously proposed based on molecular (Pileggi & Mantelatto, 2010) and morphological data (Pileggi & Mantelatto, 2012). If we assume that the two lineages observed here came from ancient populations distributed over the highlands of southern and southeastern Brazil, since the closest species Cryphiops brasiliensis Corrêa, 1973 and Macrobrachium iheringi (Ortmann, 1897) occur in this region and in central Brazil (Pileggi & Mantelatto, 2010), the existence of two genetic groups may be the result of different geological events. Such events would be the capture of highlands headwaters by erosion and other geological events (Ribeiro, 2006). However, the relatively low genetic distance between the groups weakens this hypothesis. More strongly, our study demonstrates that small monophyletic groups within this Macrobrachium potiuna complex can show differences in terms of habitat and lifestyle. Specimens of Macrobrachium potiuna "sensu stricto" are often found in streams of hills and slopes, which usually have clear water, rocky bottoms, and rapids. In contrast, specimens of the M. potiuna "Affinis-Clade" often inhabit coastal lowland streams, which usually have dark water, marginal vegetation, and slow current. These differences in the characteristics of the environments in which specimens of each clade are regularly found may indicate the presence of an ecological barrier, with a speciation process of each group occupying different niches. Some systematic studies, combined with behavioral and ecological observations, have revealed the evolutionary basis for most peculiar behaviors and the conditions favoring colonization and subsequent evolution (see Baeza et al., 2010 for references). Ecological speciation in response to different environmental pressures has been reported for neighboring populations of several groups of organisms (Schluter, 2009). Among aquatic animals, sympatric speciation has been already reported for fish species that diverge between benthic and limnetic forms (Rundle et al., 2000; Barluenga et al., 2006), and among populations that reproduce in the sea and in rivers (Hendry et al., 2000). Although some studies have reported evidences of sympatric ecological speciation in freshwater crustaceans (Von Rintelen et al., 2007, 2010), the study of this issue is still in an early phase for freshwater crustaceans, and we argue in favor of future phylogenetic studies in combination with ecological approaches to improve our knowledge of evolution within freshwater species. The mean 16S rRNA gene divergence between M. potiuna "sensu stricto" and M. potiuna "Affinis-Clade" was comparable to that reported between some sister species of freshwater carideans (Muñoz et al., 2009; Pileggi & Mantelatto, 2010; Torati & Mantelatto, 2012). The relatively small genetic distance between the groups may indicate a recent divergence of the lineages. The maintenance of this genetic population structure may be the result of low or absent genetic flow among some populations. M. potiuna is a freshwater species, and its adult forms cannot disperse between basins through the ocean. Furthermore, the extremely abbreviated larval development of M. potiuna also limits its potential for dispersal as larvae or juveniles; additionally, experimental observations demonstrated that M. potiuna only complete the larval development in freshwater conditions or low salinities around 13 ppt (S.L.S. Bueno, pers. comm.). This hypothesis is enhanced, since widely distribued populations of American freshwater species with extended larval development (e.g., Macrobrachium carcinus and M. olfersii) did not form distinct genetic structures by the 16S mitochondrial gene (Pileggi & Mantelatto, 2010; Rossi & Mantelatto, 2013). Nevertheless, because during periods of high rainfall, juveniles of M. potiuna can be carried to inshore areas, and because they have some resistance to changes in temperature and salinity, restricted dispersal between adjacent coastal basins appears to be possible: in experimental observations, adults of M. potiuna were strong hyperosmotic regulators in freshwater or low salinities (0-14 ppt), while at high salinities (21-35 ppt) they were hypoconformers; mortality started at salinity of 21 ppt, and metabolic rates tended to decline with salinity increase (for details see Moreira et al., 1983). In addition, M. potiuna is found in natural environments with high variability of water temperature (for review see Boos & Althoff, 2002). Since this species seems to be distributed continuously along hundreds of kilometers of the coastal drainage, the consequent question is why genetic differentiation can be detected between the northern and southern populations. The cause is still uncertain, and requires more detailed phylogeographic studies to resolve this issue. However, the 16Smt results clearly indicate that there is genetic structure among populations that are morphologically recognized as M. potiuna. The morphological variability reported for the species, may represent variations related to low or absent gene flow between populations. The existence of these two distinct genetic groups, within the M. potiuna "sensu lato" entity, must be considered in future ecological, morphological, physiological, and any other studies. In decapod crustaceans, the 16Smt gene has been considered conserved and applicable to high levels. However, in some cases it is useful to infer genetic differentiation among species and populations (Schneider-Broussard et al., 1998; Schubart et al., 2000; Francisco & Galetti Jr., 2005; Torati & Mantelatto, 2012). The use of more variable genes, such as cytochrome oxidase subunit I (COI), including a haplotype network, is in progress, and might show whether there are only two or more genetically distinct groups within M. potiuna "sensu lato ". Moreover, a detailed morphological analysis should be performed to identify characters that could both support the molecularly detected groups, and allow the description of at least one new taxonomic entity to accommodate the populations of the M. potiuna "Affinis-Clade", which also presented an intriguing two subgroups (A and B in the Fig. 2), that were well supported in both analyses. As recently reported in other genera (Torati & Mantelatto, 2012; Negri et al., 2012), our results also show that decapod diversity in South America is still underestimated due to the existence of cryptic species or difficulties with species delimitation due to the high morphological variability. Thus, the number of species could potentially be significantly increased with the use of molecular tools to aid in distinguishing these species. On the other hand, these tools may also provide a better understanding of decapod diversity, allowing the elimination of non-monophyletic taxa, which tend to foster overestimates of the number of species due to phenotypic variation. 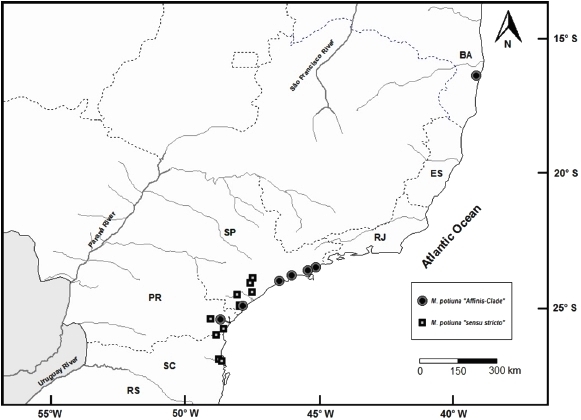 The present study is part of a long-term project to evaluate the taxonomy of freshwater/estuarine decapods in Brazil, supported by scientific grants provided to FLM by the Fundação de Amparo à Pesquisa do Estado de São Paulo - FAPESP (2002/08178-9; Biota 2010/50188-8; Coleções Científicas 2009/54931-0), and the Conselho Nacional de Desenvolvimento Científico e Técnológico - CNPq (472746/2004-9, 491490/2004-6, 473050/2007-2, and 471011/2011-8; Research Scholarships PQ 301261/ 2004-0, 301359/2007-5 and 302748/2010-5). FLC and LGP are supported by PhD and post-doctoral fellowships from CNPq (Proc. 140199/2011-0) and CAPES (Proc. 02630/09-5), respectively. We are grateful to the Instituto Bios - INIBIO, RPPN Estação Veracel, to the Department of Biology and Postgraduate Program in Comparative Biology of the FFCLRP/USP, CEBIMar/USP and Instituto Oceanográfico-USP/Base Cananéia for partial financial and logistic support, and to many colleagues and friends (Alexandre Almeida, Cassiano Caluff, Edvanda Souza-Carvalho, Emerson Mossolin, Georgina Bond-Buckup, Harry Boos, Sérgio Althoff, Sergio Bueno) for their help in collections, for making available some essential fresh specimens, for lending material from collections used in our research, and for critical discussion during the preparation of this manuscript. Special thanks to all members of LBSC for their assistance during the development of this study, to Dr. Rafael Robles for Spanish translation, to Dr. Janet Reid (JWR Associates) for providing the English review service, and to anonymous reviewers for suggestions and contributions toward improving this article. The collections of species conducted in this study complied with current applicable state and federal laws of Brazil (ICMBio 29811-1 and 25030-2; DIFAP/IBAMA/126/05; permanent license to FLM for collection of Zoological Material No. 11777-1 MMA/IBAMA/SISBIO).